Hollywood has created a new “hero”, Abraham Lincoln, for their patriotism program. President Obama swore on the same Bible as President Lincoln at both his inaugurations. In his 2009 speech he declared that “the lines of tribe shall soon dissolve”. He vowed to finish Lincoln’s Indigenous genocide program, as we are still in the path of the bankers, the governments they control and their deadly war games. Mr. Lincoln earned a fraudulent place in history. He signed the Homestead Act in 1862. This was a law offering huge tracts of our lands to foreign white settlement. It was put through without consultation, consent or regard for the rights and needs of our people. Eventually 1.6 million homesteads were granted on our land and 270,000,000 acres of our territories were privatized between 1862 and 1886, which is 10% of all US lands. in the conflicts that raged over this illegal action, thousands of Ongwehonwe men, women and children were killed and millions of acres of our territories remain unlawfully occupied. Two days after Lincoln signed the “Emancipation Proclamation” in 1863, he signed an order to hang 38 Dakota in Mankato Minnesota, who were defending their people and land. There were only about 40 adult men of fighting age left out of 400 ”prisoners of war”. The US agent refused to feed the Indigenous people and was selling the rations that were meant for them. The men begged for food for their people who were starving to death. He told them to eat grass. They killed him and stuffed his mouth with grass. [www.republicoflakotah.com]. 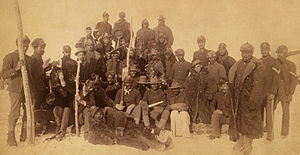 After the Civil War, Lincoln set up the “Buffalo Soldiers” 10th Cavalry regiment in 1866. The black soldiers’ job was to murder our people. They attacked us 127 times. 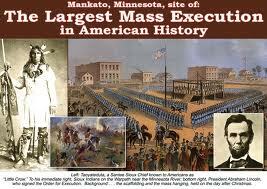 10 Medals of Honor were awarded to them for slaughtering our men, women and children between 1866 and 1890. They were at Wounded Knee helping their masters kill and bury our people. Lincoln set them up to protect the white invading settlers by starving and killing us. He is celebrated as a hero because of his murder of thousand of Indigenous men, women and children and the theft of millions of acres of our land.